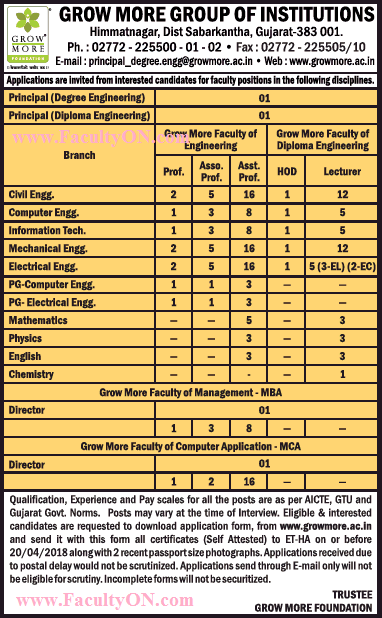 Grow More Group of Institutions, Sabarkantha has advertised in THE TIMES OF INDIA newspaper for recruitment of Professor / Associate Professor / Assistant Professor / Principal / HOD / Lecturers / Director jobs vacancies. Interested and eligible job aspirants are requested to apply on or before 20th April 2018. Check out further more details below. About College: Sister Nibedita Government General Degree College for Girls, Hastings House, is the first government girls' degree college in West Bengal to be established after independence. How to Apply: Interested candidates are requested to download the application form from the college website and send filled-in form along with self attested copies of certificates, recent PP size photo to the address provided below.